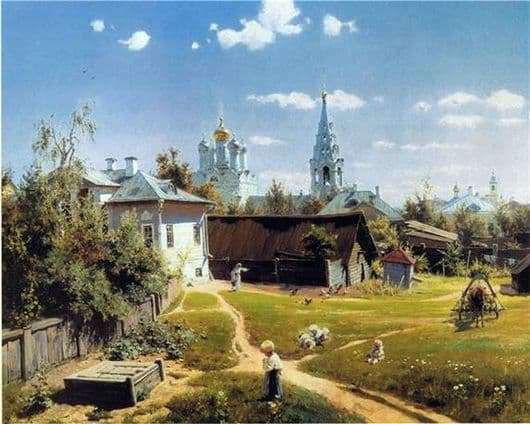 Painting V. Polenova “Moscow Yard” written in 1878. she brought the artist fame and glory, she tells the viewer about something close and dear to everyone living in every consciousness since childhood. The painting depicts a typical corner in old Moscow, with the Church of the Savior on the Sands, located near the old Arbat street. The usual courtyard is permeated with sunlight on one of the brightly sunny days of summer. Green grass covered with courtyard, with all sorts of shades. Cirrus clouds float easily across the sky, the sun rises and warms the earth with its warmth, igniting the domes of churches with a bright glow and shortening the shadow. The courtyard is gradually enlivened. In the background, the five-domed church and the bell tower with golden domes are visible. The entire courtyard is a small lawn with a barn, a well and a house. Not far from the barn there is a horse harnessed to a sleigh, waiting for its owner, shifting from foot to foot. From the right foreground there is a path leading to a merchant’s two-storied mansion with barns. Near the house you can see a young woman peasant who comes with a bucket, and at the barn hen are busy digging, in the same place, the clothes are dried on a rope. In the center, a wide path crosses a narrow path leading to a well for water. On the middle plan of the courtyard, in emerald green grass, two kids started a game, a little kid is located across the path on the lawn and cries, but nobody pays attention to him. A girl in a long skirt and a white sweater is standing and carefully considering something, holding it in her hands. Near the front garden with a fence, an old well with a wooden lid, and behind it a fence from which green overgrown burdock hang. The picture shows the feeling of everyday rush and movement. Everyone is busy with his own affairs.